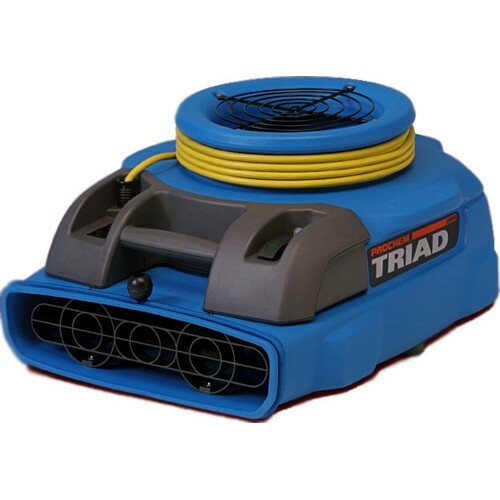 The Triad is the first air mover in the industry to utilize “Thrust Fan” technology. Using this technology, the Triad offers the most critical elements for best evaporation results, high static pressure, high airflow volume and high velocity. Also, no longer do you need to compromise evaporation rates due to power limitations. Eight Triads can easily be daisy-chained on a 12 Amp circuit! This significantly increases faster evaporation potential! The Triad creates labor efficiency and speed. Weighing only 21.7 lbs., the Triad is lighter in weight than conventional air movers, and the "briefcase-style" handle makes the air mover very easy to transport. The Triad also offers the best space maximization in the industry. With the Triad being almost one-half the size of conventional air movers, you can fit up to twice as many air movers your vehicle, which will produce savings on transportation costs. The Triad’s design and size offers several unique solutions for the restoration industry, and it will fit where most conventional air movers have difficulty. The Triad can be placed on its side to gain higher reach on “wicked” walls or placed vertically for Class 3 losses on the ceiling. The Triad has a down draft feature to dry directly underneath the air mover. The Triad offers air flow control options, having the ability to be ducted from either its in-take or out-take. The Triad is formulated specifically for restoration, delivering like no other for today’s routine real world challenges!